Will the energy last until next year's midterm elections? President Donald Trump’s first months in office have been marked by a surge in liberal activism that’s persisted long beyond the women’s marches the day after his inauguration. Progressive groups are seeing record donations and renewed interest in running for office, while Congress has been deluged with constituent phone calls. New polling from SurveyMonkey quantifies just how concentrated that enthusiasm is: Self-described liberal Democrats are more than twice as likely as the public as a whole to say they’ve engaged in some form of activism during the past two months. That ratio extends to a wide variety of actions, with liberal Democrats roughly two times likelier to report having shared opinions on social media, signed petitions, written to Congress, donated money, protested and attended local meetings. By some measures, progressive women seem to be particularly motivated. Although their overall levels of activism were similar, female liberal Democrats were 7 percentage points likelier than their male counterparts to report protesting, marching or demonstrating in the last two months, according to SurveyMonkey, and 6 points likelier to say they’d written to their members of Congress. In another survey, conducted by The Washington Post in February, they were 13 percentage points likelier than Democratic men to say they planned to get more involved in political causes this year. “I think there was something really catalyzing about this election, for women in particular,” said Laura Moser, a newly minted activist and the founder of a text-message-based system called Daily Action. The service suggests a daily civic action for subscribers to carry out each morning ― often calling a legislator to register opposition to one of Trump’s policies or nominees. Since the service launched last December, according to Moser, it has garnered more than 250,000 subscribers and logs an average of 10,000 calls per day. The activists flooding congressional offices with those calls are overwhelmingly female, according to a survey conducted by Democratic pollsters Lake Research Partners and shared with HuffPost. Of the more than 28,000 of the group’s members who responded to a poll sent out by text message, 86 percent were women and more than 60 percent were 46 or older. Two-thirds of those polled said they’d joined one of the women’s marches after Trump’s inauguration ― an event that left many attendees eager to continue their activism. They’re especially fired up about health care and climate change, which 37 percent and 36 percent, respectively, named as their “#1 voting issue.” Far fewer named reproductive rights, immigration or the economy as their priority. Part of that likely comes down to the timing of the survey, which was fielded March 17-20, just as the debate over Republicans’ Obamacare repeal bill came to a head amid intense opposition from those who had voted for Democratic presidential candidate Hillary Clinton. Environmental issues also stand out as an area where Trump’s latest policies fall especially and increasingly out of step with public opinion. The Daily Action users polled don’t intend to give up the fight anytime soon: About three-quarters said they’d be very likely to attend protests against the Trump administration’s policies in the future. 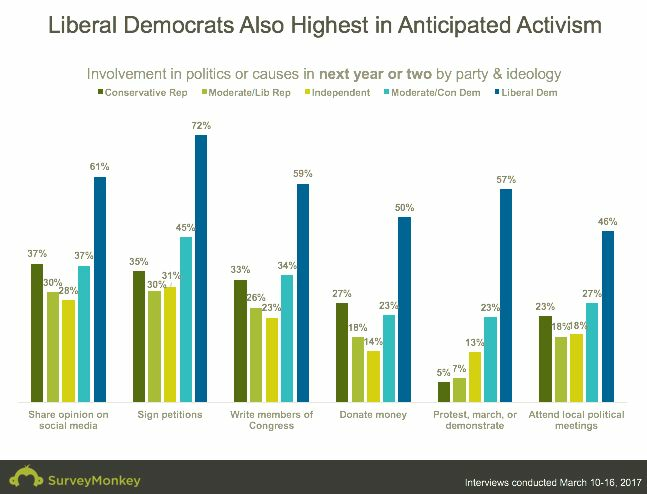 SurveyMonkey’s national polling also finds liberal Democrats strikingly gung-ho about carrying their activism through to the next few years. But it remains to be seen if progressive’s current level of enthusiasm can last through the 2018 midterms. While poor Democratic turnout likely didn’t cost Clinton the election last year, the party does traditionally struggle in midterms, when many of their base voters, such as younger Americans and minorities, tend to turn out in relatively low numbers. Moser said she hopes the current level of progressive engagement will last through the setbacks inherent in facing off against a Republican-controlled White House and Congress. “I think that’s a real concern that we’re all grappling with,” she said, noting that the GOP’s failure to repeal Obamacare had helped to buoy activists’ spirits after their failure to prevent the confirmation of Betsy DeVos as secretary of education.